The debate surrounding the shift often focuses on the immediately practical points of the technology choices and the mechanics of who pays for it and how. This short paper instead tries to consider the movements in the market that are underway and how these might best be supported. The starting point for this is a model I’ve borrowed from work done by Evans and Wurster in their excellent book, “Blown to Bits”, looking into some of the reasons the dot.com bubble burst and some of the survival strategies that helped others prosper. While I’m not suggesting we are approaching a similarly apocalyptic moment, their view of how organisations align to form a market is pertinent. They suggest that all organisations within properly functioning markets have to consider a trade-off between what they call “reach” and “richness” – market reach contrasted against the ability to customise and tailor a service. All businesses sit somewhere along that line with perhaps McDonalds at one end with a global reach but a low ability to offer you anything other than what’s on their globally fixed menu, and the Roux family restaurants at the other end who find it impossible to become a global restaurant empire but they can offer you precisely what you want. Applying this model to today’s telecoms market is revealing – the curve is disjointed, with commodity but high-reach broadband offerings at one end, and high-value corporate products at the other with few if any services completing the curve. At the consumer end exists ADSL products where differentiation is limited to little more than brand and contention, while at the other end are wholesale Ethernet products attached to MPLS clouds and the like – and there is almost nothing in between. It can be reasonably argued that this is a natural result of the necessary scale of a utility infrastructure that needs to consider the best solutions for the widest audience and not easily consider the best service for each customer – this can be done but at a price and only to a select sub-market. In many respects, therefore, we should not consider telecommunications as a single market but a group of sub-markets which are quite distinct and typically with specialist providers in each, and to understand the whole market stresses, therefore, it’s important to understand how each of these sub-markets are reacting to the move towards fibre-based services. An important aside we’ll return to was the emergence of first generation community-led broadband schemes. These were typically wireless-based services built and operated by communities in areas where early ADSL services were unlikely to appear from the main commercial operators in the short to medium term. The motivation of these projects was typically not to become life-long network operators, although there are exceptions to this, but to prove demand where it was doubted and to ensure they weren’t disadvantaged in the medium term as neighbouring communities started to exploit ADSL services. These schemes delivered very low reach but typically developed much greater “richness” – their engagement within their communities and the support work in helping neighbours get online ensured higher levels of take-up, proving the demand that others doubted. But, I’d argue, few of these initiatives ever really formed part of what we typically consider the telecommunications market. That in no way diminishes the value and importance of these schemes, quite the reverse. These schemes found ways to deliver services to places where it was thought impossible and delivered demand where it was thought not to exist. In summary, a key impact of first generation community-led schemes was that they provided a strong impulse for change in the traditional telecommunications market but they did this without themselves becoming a part of it. The first moves in the migration to next generation fibre-based services are now well underway but it’s clear that different markets have taken quite markedly different paths ranging from the highly centralised Australian National Broadband Plan to some European countries highly decentralised metro-network programmes. It is perhaps natural to consider which of these approaches is right and which are wrong but rarely can migrations as significant as this be distilled down to a simple right and wrong. In helping to understand the shifts that are underway, and therefore how these different strategies may help or potentially hinder the migration, the reach-richness model provides some interesting insights. 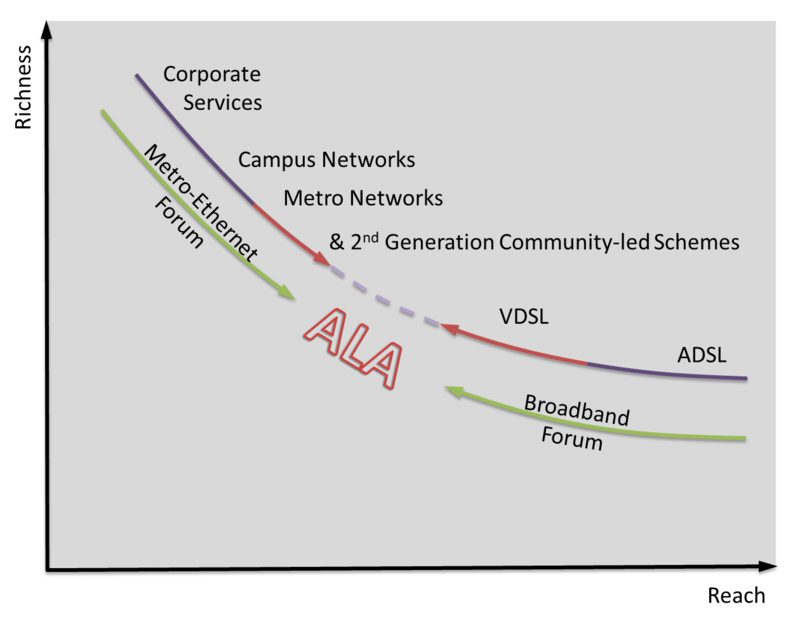 The emergence of VDSL services is perhaps the simplest to plot on the curve – it is a perfectly natural evolution from first generation ADSL services by increasing the richness of the offerings through significant speed increases but with some reduction in market reach – while all premises are connected to an exchange not all cabinets are suitably located and not all premises are connected cabinets reducing the reach of VDSL. It is the development of more decentralised approaches which require a little more consideration before judging whether they are an evolution of the first generation community-led schemes or if they are a shift in the main telecommunications market – and there will be a mix where some schemes clearly want to promote their credentials as part of a different market more associated with the first generation. However, the impact this group is likely to have may turn out to be similar to the first generation – they provide a powerful impulse for operations on the curve, encouraging developments more widely than might otherwise happen but they are less likely to evolve mechanisms that deliver scale themselves. In contrast, it is those initiatives that are attempting to align themselves with the core market that are more likely to have a wider impact on the overall shift in the market as this is where the models can develop scale and be more readily replicated. Here, there appears to be a natural evolution of approach that began in campus networks and has grown in concept into the Metro-nets we see across Europe and the US, and are emerging in the UK. It could be argued that this is perhaps a key reason these initiatives have tended to favour Ethernet, the natural choice of campus networks; as much a cultural as technical or commercial decision, just as operators at the other end of the curve tend to favour VDSL and PON. The natural scale and the focus on a “rich” solution tailored to both the customer and the geography allows operators at this end of the curve to find viable solutions in harder to reach niches than operators arriving from the other end of the curve. An operator in this space is unlikely to compete on a national scale but international examples can be found where their scale is significant or where the market sector is developing significant scale. For example, almost a quarter of the US fibre market is held by smaller alternative providers where the average individual operator has fewer than 10,000 subscribers. A simplistic conclusion, therefore, might be that the Metro-Ethernet Forum and their supporters are preparing for a face off over the middle ground with the Broadband Forum and their members but the work of the UK’s NICC has demonstrated that this is far from the truth, even if it makes less exciting headlines. The NICC’s work on Active Line Access (ALA) has seamlessly codified the co-existence of Ethernet, VDSL and PON networks in a single market, allowing the increasing reach of the evolved campus companies while simultaneously supporting increased richness in the mass-market offerings. And these shifts in market behaviours are not one-sided. In developing their pioneering service, OnsNet in The Netherlands developed what they call their 7-pillars model which encapsulates the different characteristics they consider a successful fibre-based network will need to embody. While their approach and intent is very clearly from the campus end of the curve, and has served them and their followers very well, it would also be fair to say that some of their teaching has been taken on by Reggefiber, a company that is industrialising the Metronet approach in The Netherlands. While I’m sure Kees Rovers, the founder of OnsNet would say they are not applying their thinking in the round, it would be fair to say that Reggefiber would not be able make a success of what is essentially a traditional utility model typified by homogeneity without borrowing some of the OnsNet philosophy around engagement and communications. It is now possible to see how the bifurcated curve might edge towards becoming a full market spectrum. Certainly the movement from both directions along the curve is undeniable, and there are growing signs that there is learning from both movements’ approaches, so the questions that remain focus on whether the market will join in the middle or at least complete enough of the curve to ensure solutions are sufficiently widely available to support a future economy. These, in the first instance, are questions of policy and then of regulation. It could be argued that the market interventions by the UK Government have so far focused on the movement along the curve from the mass-market end. In the context of this model, this perhaps the more obvious initial intervention and the one most likely to have the greatest initial impact on market reach. Any approach to a whole market policy at some point needs to consider the two ends of this curve as distinct sub-markets, each with their own distinct commercial and technical constraints and opportunities. The “reach” sub-market as it picks up greater “richness” will have a very different investment profile and dynamics to the “richness” sub-market at it attempts gain greater market reach. One of the emerging reactions in this shift from the high-reach end of the spectrum is how the increasing richness can be tempered, probably to protect revenues from the other end of the curve. This has manifested itself in two key ways so far in the UK. Firstly, the high-reach operators have been reluctant to adopt the full ALA standard, relying instead on the General Ethernet Access (GEA) subset which removes the multiple VLAN and quality-assurance mechanisms which thus far have been the preserve of high-revenue corporate services. Secondly, there is growing evidence that VDSL services are significantly less likely to be delivered to more commercial zones, probably for very similar reasons.